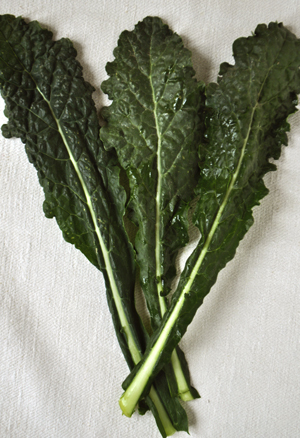 Wash, de-stem, and tear the kale into bite-sized pieces. Heat the olive oil in a sauté pan or a wok over a hot flame, or high heat. When the oil is hot, add the kale. Stir and add the garlic. Then add the fish sauce, the lemon juice and salt to taste. Keep stirring the kale until it has wilted. Add the sesame seeds and serve. Note: The oil will crackle loudly and splatter when you put the kale in thepan. You can “smoosh and stir” the kale a little as it is cooking so that it will cook faster.